LoRa MESH Radio Module is a high performance, low power, long-range micro-power RF module, using a distributed ad-hoc network communication mode, embedded wireless MESH MANET protocols, users do not need to do anything modified to present devices, protocols, nor need for secondary development to module, but can easily implement wireless ad-hoc networks. RF chip module technology based on spread spectrum frequency hopping, spread spectrum calculations and leading internal automatic CRC error correction processing. The stability, anti-interference ability and receive sensitivity are better than other types of modules. Module also supports API mode, transparent mode and AT command mode, the user can configure our PC software, or send AT commands through the microcontroller, based on the parameters of the actual demand for flexible configuration of the module, simple operation, easy to use, strong adaptation. Recommend USB to TTL Converter to set the module parameter, and Gravity IO Expansion Shield can directly work with the Lora modules. Half-duplex communications, serial data transparent transmission. Embedded MESH distributed MANET protocols. Each communication has multiple handshake confirmation, to ensure the stability of the data. Production free debugging, 3.4-5.5V voltage range can be customized 2.1-3.6V. Micro-power transmission, standard 100mW, 7-Level adjustable. Receive sensitivity up to -148dBm, the maximum transmit power + 20dBm. High-efficiency forward error correction coding techniques and frequency hopping mechanism, anti-interference ability, low error rate. Support Serial wake, ready to send and receive data, no periodic wake-up time. Support Air wake AUX signal given by the module, Wake user device. CAD detection LoRa signal, to prevent accidental wake. Communication protocol conversion and RF transceiver to switch automatically, without user intervention, simple to use. Can be flexibly set the module parameters via software or microcontroller commands. 2.54 standard pin interface, easy embedded installation, TTL level signals. Built-in watchdog to ensure long-term reliable and stable operation. 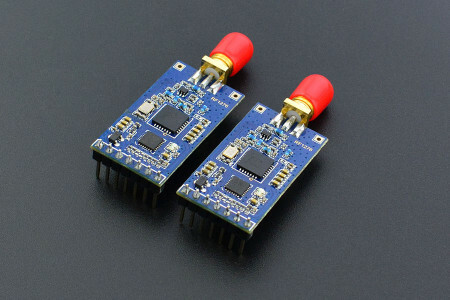 Open ground between nodes effective communication distance up to 2-3 km.